Are you a pet owner struggling with pet allergy and/or pet odors? In this in-depth buying guide, we are going to review the best air purifiers for pet dander, pet hair and pet odors. All our top picks are HEPA air purifiers, which are the best for dealing with pet allergens and smells. Why Buy an Air Purifier for Pets? An air purifier allows you to live comfortably with your pet especially if you have a dog or cat allergy. But it’s not just pet allergy sufferers who need an air purifier. According to the Asthma and Allergy Foundation of America, people with other allergies or Asthma are highly likely to be also allergic to pets. The best treatment for pet allergy is to avoid keeping pets at home. But if you still want to live with your cat or dog, the next best option is to buy a HEPA air purifier for pets. It will filter out almost all airborne pet allergens from the air. Note: If you have a severe pet allergy, the best option may be to avoid living with a pet. Consult your doctor before you make a decision on whether to keep your pet or not. Even if you do not have a pet allergy, an air purifier can still help if you have pets around. Pet dander can still cause mild allergy-like symptoms in healthy people including stuffiness, sneezing, and itchy eyes. Pet hair can also carry other allergens and pollutants like pollen and dust around the house. Simply put, pets, as lovely as they are, reduce indoor air quality. If it’s not dander, it’s the stink from their litter. A good quality air purifier ensures your indoor air remains clean, fresh and allergen-free. This is the best HEPA air purifier for most pet owners. It’s powerful enough to cover small and medium size rooms (up to 283 sq. ft.), it provides high-performance 5-stage filtration and it has an auto mode. We also love that it comes with remote control, a convenience you don’t get with most air purifiers. Maintenance is a bit expensive because of multiple filter replacements. Auto mode doesn’t work very well. Washable pre-filter: Tackles the larger particles in the air such as pet hair. This filter is washable so no need to replace it. True HEPA filter: Captures allergens and pollutants as small as 0.3 microns including pet dander, dust, smoke and mold spores. Anti-bacterial treatment: Prevents mold and bacteria from developing on the HEPA filter. Granular carbon filter: Provides advanced odor control. Perfect for dealing with pet litter smells. PlasmaWave Technology: That’s fancy for ionizer. It makes it easier to remove allergens from the air. If you are concerned about ozone, you can turn it off. The Winix WAC9500 is one of the few air purifiers that come with remote control. This makes it so much easier to change settings and select different features from the comfort of your couch. The Winix WAC9500 has an auto mode that in theory should conveniently set the perfect fan speed based on air quality. It works sometimes, but most users say the sensors are not as accurate as they should be. In auto mode, the air purifier tends to stay at the lowest fan speed even when there is dust and odors in the air. You’ll find it easier just to select the fan settings yourself. There are four levels to choose. But at least you’ll have the remote control, which makes it easier to change settings. You can select sleep mode or auto sleep mode using the remote control. The first dims the lights and turns the fan to the lowest speed setting to allow you to sleep without distractions. In the second mode, the air purifier will detect ambient light levels and turn on sleep mode automatically at night. The air purifier’s auto mode doesn’t work quite as well as that of other air purifiers. You have to stick to manually changing fan settings. The filter replacements themselves are not expensive; the issue is the number of filters you have to change. In most air purifiers, you only have to change two filters. In the Winix WAC9500, you have to replace two primary filters plus the UV bulb. Over time, the costs add up. This air purifier is best for: Most homes with pets including those with multiple pets. Avoid if: You want an air purifier for a large room (over 300 sq. ft.). 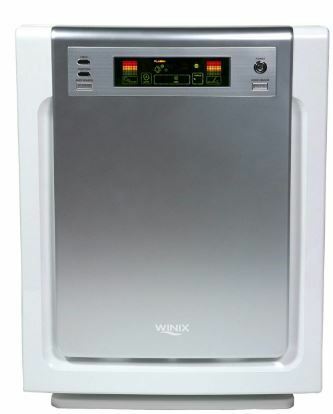 The Winix WAC9500 is ideal for small and medium-size rooms only. If you are looking for an air purifier you can use in your home office, bedroom or a small living room, we recommend the GermGuardian AC5250PT. It’s perfectly sized for smaller rooms of up to 180 square feet. It uses a 3-stage filtration process to remove mold spores, pet dander, dust and other allergens from the air. This includes a carbon filter, a HEPA filter, and a UV-C lamp. 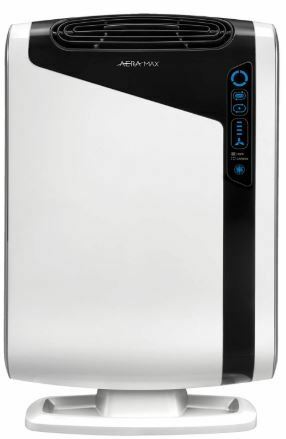 The GermGuardian AC5250PT has two primary filters: a carbon filter that captures large allergens and filters out odors and a HEPA filter that captures tiny allergens like pet dander and mold spores. The air purifier has an extra line of defense to ensure the best air quality. An integrated UV-C bulb targets airborne bacteria, viruses and mold spores. If your pet has just used the litter box or the air feels particularly dirty, you can increase fan speed to remove odors and allergens quickly. At the highest speeds, the air purifier is relatively noisy, similar to most other air purifiers. But at medium and low speeds, which are the ones you’ll be using most of the time, the fan is barely audible. At the lowest speed, you can sleep soundly without any noises to distract you. An indicator on the air purifier will light up when it’s time to change the filter or the bulb. The filters last about 6 months while the bulb lasts for about a year. Another convenient feature is the auto switch off timer. It’s handy for nighttime use or in case you forget to switch off the air purifier when leaving home. 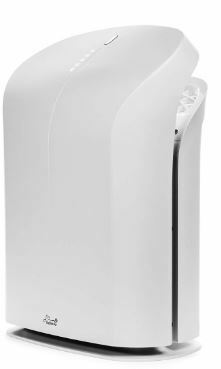 The GermGuardian AC5250PT works best in small rooms. You can still use it in a room larger than the max recommended area of 180 sq. ft. but it will clean the air slower and less efficiently. If you want this air purifier instead of a larger one with more coverage, consider getting two of them. At speed levels 4 and 5, you’ll have to turn up the TV volume. It’ll also be difficult to carry on any conversation. You have to select the right fan speed manually. With auto mode, the air purifier would automatically pick the best fan speed based on the air quality. The lack of auto mode also means the GermGuardian AC5250PT doesn’t have an air quality indicator. 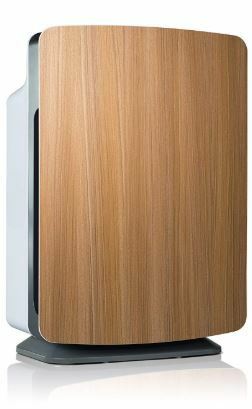 This air purifier is best for: Any pet owner looking for a compact HEPA air purifier for a small room. Avoid if: You want an air purifier you can use in a large room. Having two or more pets means higher levels of allergens in the air. You’ll need an air purifier powerful enough to remove all the pet dander and hair floating in the air as well as the dust and pollen the pets bring into the house. We recommend the AeraMax 300. Rated for rooms up to 600 square feet, the AeraMax 300 uses 4-stage filtration to remove pet dander, pet odors and other allergens from indoor air. A smart set and forget auto mode automatically increases performance to keep up with the number of pet allergens in the air. Carbon pre-filter: Captures pet odors, smoke and large particles like pet hair. True HEPA filter: Filters out pet dander, pollen, fine dust and mold spores. Antimicrobial treatment: Prevents the growth of bacteria and mold inside the air purifier. Ionizer: Clumps together allergens and pollutants, making it easier to filter them out of the air. You can manually select from the four fan speeds to vary the air purifier’s performance and noise level. But the auto mode is more convenient to use. Using an integrated air quality sensor, the air purifier will automatically select the best fan speed based on air quality. The sensor also displays the air quality using a color-coded indicator. Red means dirty air, blue means the indoor air is clean and amber means air quality is somewhere in the middle. For pet owners with allergies, allergy season can be especially bad. As if pet hair and dander are not enough, you also have to deal with higher levels of pollen, dust and other allergens. The Aeramax 300 has a special mode called Aera+ that you can turn on when allergen levels are particularly high. It kicks up the air purifier’s performance to keep the air clean. If you prefer a completely dark bedroom, you’ll find the light panel on this air purifier to be annoying. There is no button or mode to dim or turn off the lights. You most likely will have to keep the ionizer off if you get the AeraMax 300. That’s because it produces an annoying high-pitched sound that is especially audible at night. This air purifier is best for: Homes with multiple pets. 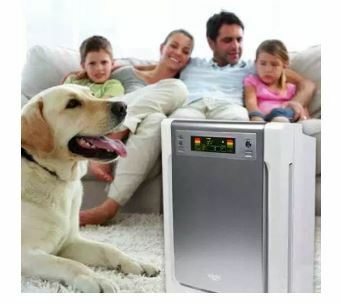 Also great for pet owners who want a powerful air purifier for a large room. Avoid if: You are looking for an air purifier for a small room (under 200 square feet). 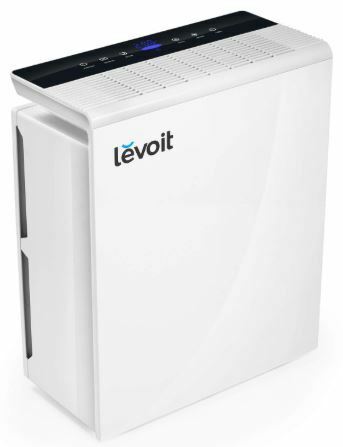 If you are concerned about your family and pets being exposed to ozone, the LEVOIT LV-PUR131 is the best choice. Unlike most air purifiers, it does not have a negative ion generator or a UV lamp meaning it doesn’t produce any ozone at all. While most air purifiers with ionizers produce very low levels of ozone, research is not clear on the long-term effect of exposure to any level of ozone. This is the best air purifier if you don’t want to risk any exposure to your family and pets. The lack of an ionizer means the LV-PUR131 has one less stage than most other air purifiers. But the three stages do a great job removing allergens, odors, and pollutants from indoor air. They include a pre-filter for dust, dander and pet hair, a HEPA filter for finer allergens like mold spores and an activated carbon filter for odors. The auto mode feature lets you enjoy the air purifier without messing with any fan speed settings. Instead, an air sensor constantly monitors air quality and automatically increases fan speed if it detects a spike in allergens or smell. It also displays real-time air quality through an air quality indicator. It changes color to show whether your indoor air is dirty, medium-clean or clean. Select sleep mode and the air purifier instantly turns off all lights and selects the lowest and quietest fan speed. You can also set a timer before you sleep and the unit will automatically turn off after the selected number of hours. Several users say the reset button doesn’t always work. Pressing it should remove the filter replacement warning after you put in a new filter but it sometimes doesn’t. At higher speeds, the fan can be quite noisy especially if you are trying to watch a movie or talk to someone. The LV-PUR131 is surprisingly cheap considering its coverage and features. I guess one of the things they sacrificed to lower the price tag is build quality. Customers say the air purifier doesn’t feel like it will last for more than a couple of years. This air purifier is best for: Pet owners looking for an ozone-free air purifier. Avoid if: You want an air purifier that is well made, meaning it can survive around kids and pets and will last long. If you want an air purifier that is guaranteed to last long, we recommend the Oransi OV200. Most air purifiers have a 1-2 year warranty. The Oransi OV200 has a 10-year warranty. Beyond its excellent build quality, the air purifier offers high-performance 3-stage air filtration, powerful large room coverage and easy control via remote control. The Oransi OV200 is another good choice if you are concerned about ozone exposure. It doesn’t have an ion generate or a UV bulb. It uses three mechanical filters. Pre-filter: Captures the larger particles like pet hair and dust. 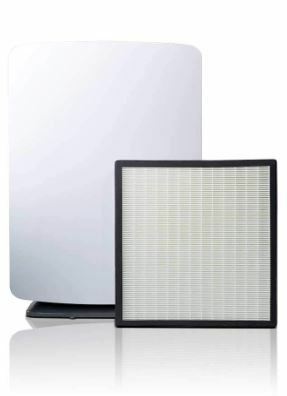 HEPA filter: Captures 99.97% of allergens as small as 0.3 microns including mold spores, pet dander, and fine dust. Activated carbon filter: Removes common household odors associated with smoking, cooking, aerosol sprays and pets. Instead of selecting fan speed manually, select auto mode and the air purifier will automatically set the best fan speed for your home’s air quality. When the air sensor detects a spike in allergen levels, fan speed increases to clean the air quicker. When the air gets clean, the air purifier reduces fan speed to save energy and reduce noise. The air purifier’s lightweight and compact design makes it easy to move between different rooms. Sleep mode turns off the lights and reduces fan noise to create an optimal sleeping environment. However, if you prefer to slumber off to white noise, you can increase fan speed to enjoy the relaxing hum. This is one of the few portable air purifiers that come with remote control. It makes a big difference in terms of ease of use and convenience. You don’t have to bend down every time you want to change a setting. Some people love the white noise-like sound of the fan when it’s set at the highest speed. But others find it too noisy. If you are watching a movie or using this air purifier in a nursery, the top speed is a tad too loud. This air purifier is best for: Pet owners who want a long-lasting and low-maintenance air purifier. Also ideal for anyone looking for an ozone-free air purifier for a large room. 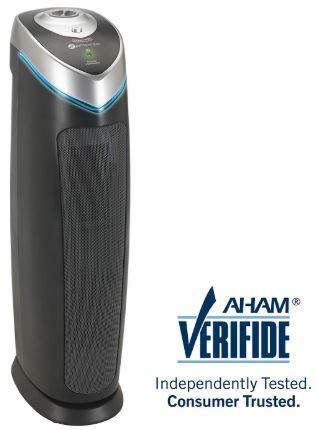 Avoid if: You are looking for a budget air purifier. This one’s a bit pricey. If the idea of changing filters every 6 months sounds tedious (and expensive), consider buying the Rabbit Air BioGS 2.0 HEPA air purifier. If you leave it on for 12 hours a day, the charcoal and HEPA filters will last a whopping 3 years. Permanent washable pre-filter: Traps large particles like pet hair and dust. BioGS HEPA Filter: Filters the tiniest of allergens including pet dander, mold spores, smoke, and fine dust. Activated carbon filter: Reduces common household odors and pet smells. Negative ion generator: Enhances air purification and freshens the air. With most air purifiers, you have to replace the filters every 6 or 12 months. The Rabbit Air BioGS 2.0 uses a HEPA filter and carbon filter that are designed to last up to 3 years. This is assuming you use it for 12 hours a day. If you prefer leaving your air purifier on 24/7, the filters will still last a respectable 15-18 months. It’s important to dust and vacuum the filters regularly to make sure they last that long. You can set the fan speed yourself or, as most users prefer, leave the air purifier on auto mode. An allergen and odor sensor constantly monitors air quality. If there is a spike in allergens and pollutants, it automatically increases fan speed until the air gets clean. 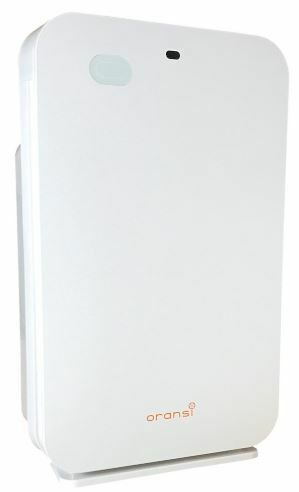 While Rabbit Air says, the air purifier is good for large rooms of up to 550 sq. ft., you’ll get the best results in a smaller room. They recommend a maximum room size of 275 sq. ft. for allergy sufferers, where it makes up to 4 air changes per hour. In a 500-550 sq. ft. room, it only manages 2 air changes per hour. You probably won’t find any air purifier as beautiful as this one. It’s big and boxy, but they’ve managed to make it look great. The neutral white finish blends perfectly into any room. Like most air purifiers, the Rabbit Air is a bit loud when the fan is spinning at the highest speed. Fortunately, you only need the highest setting when the air gets really dirty. If it is on auto mode, it will switch to the highest speed only for a short time until the air clears up. This air purifier is best for: Pet owners who want a low-maintenance air purifier with long lasting filters. Avoid if: You want an air purifier that can cover a large room. If loud sounds easily spook your pets or you want a super quiet air purifier, we recommend the highly rated MinusA2 by Rabbit Air. Like other Rabbit Air air purifiers, this one is incredibly well made. They’ve gone the extra mile, such as using expensive brushless motors, to make it quiet even when on high. It’s great for bedrooms, the nursery, living area, and home office. Washable permanent pre-filter: Removes large airborne particles and allergens. Medium filter: Removes smaller particles of up to 1 micron in size including pollen, pet dander and some mold spores. BioGS HEPA Filter: Removes even smaller particles of up to 0.3 microns including smaller mold spores, fine dust, and other allergens. 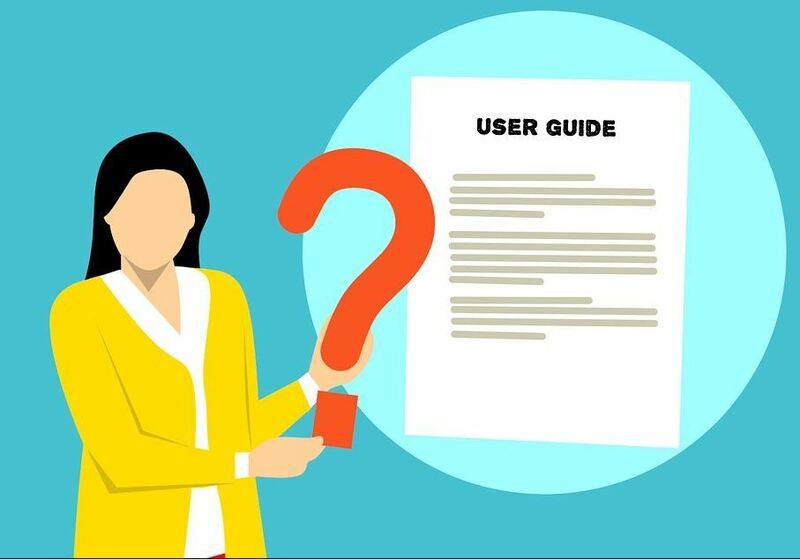 Customized filter: You can select from several types of filters depending on your air purification needs. For pet owners, we recommend the Pet Allergy filter. If it’s the litter smell bothering you, get the Odor Remover filter. Activated carbon filter: Removes common household odors. Ionizer: Produces negative ions that give the room a crispy and fresh feel. The Rabbit Air MinusA2 is designed to operate quietly even when set on the highest fan speed setting. It’s perfect for the bedroom, a baby nursery or a home office. The air purifier puts out enough power to cover large rooms of up to 700 sq. ft. In that big an area, it does two air changes per hour. For allergy sufferers, Rabbit Air recommends a max room size of 350 sq. ft. to increase the number of air changes to 4 per hour. This keeps the air cleaner. Despite its large and boxy design, the MinusA2 looks pretty cool thanks to a customizable front panel. They have several beautiful designs you can choose from. If you want to showcase your air purifier, you can mount it on the wall using the included mounting kit. It’s the only mountable air purifier we have reviewed. The air purifier senses when it’s dark and automatically enters sleep mode. This turns off the lights and lowers fan speed to provide a more comfortable sleeping environment. The Rabbit Air MinusA2 is one of the more expensive portable air purifiers. But the high price tag is not surprising considering the range of features and coverage area. This air purifier is best for: Pet owners looking for a quiet air purifier. With its powerful 1100 sq. ft. coverage, the Alen BreatheSmart is the best choice for pet owners who want an air purifier that can easily cover an extra-large space. The air purifier comes in several customizable filter options. For dealing with pet dander and pet odors, we recommend the Fur Family version. It’s optimized for pet allergens and odors. The air purifier comes with the HEPA Odor Cell filter that is designed specifically for pet owners. The filter is optimized to remove pet dander and strong pet smells. It consists of three layers that remove pet dander, mold spores, dust, pet hair, and strong household odors. 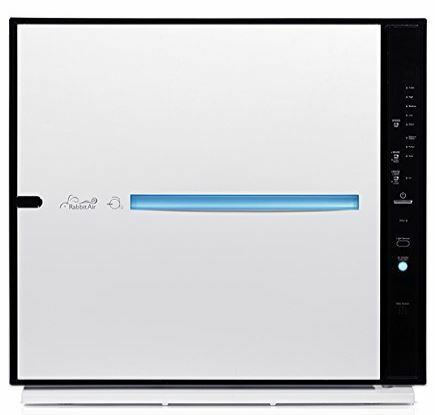 Whether you are struggling with pet allergy, the smell from your cats’ litter or a persistent wet dog smell, this air purifier should help. Instead of constantly changing fan speed, just set the air purifier to auto mode and it will do all the work for you. It uses an integrated sensor to detect allergens and pollutants in the air. If there’s a spike, it instantly increases fan speed to clean up the air faster. If you are looking for a powerful air purifier that can cover a large bedroom, an open style living area or an open basement, the Alen BreatheSmart is a great choice. Despite its size and power, the air purifier is surprisingly quiet. It’s fitted with WhisperMax technology that reduces noise levels even when the fan speed is set to the highest level. Like the Rabbit Air MinusA2, the Alen BreatheSmart is not cheap. But considering it is one of the most powerful air purifiers, we did not expect otherwise. This air purifier is best for: Pet owners who want a powerful air purifier that can cover an extra-large space. Avoid if: You are looking for a budget air purifier or an air purifier for a small room. Pet hair is actually not an allergen. But it can carry allergens that cause sneezing, stuffy nose, itchy eyes, and other symptoms. The allergen that affects most people is pet dander, flakes of dead skin the dog leaves behind on surfaces and disperses into the air. A pet’s saliva and urine can also cause allergic reactions. Pet allergens can also worsen the health of asthma suffers. The dander can trigger asthma attacks and worsen asthma symptoms. Even if you are completely healthy – no allergies and no asthma – you may still find that you are a bit sensitive to pet dander. Because it’s so small, it’s easy for it to get into your respiratory system and cause hay fever-like symptoms. Note: There’s nothing like a hypoallergenic pet. All pets produce dander and pose a health risk to people with allergies and asthma. Even short-haired dogs and cats can cause allergic reactions. It prevents allergic reactions in family members with existing allergies. The air purifier removes pet dander and other allergens from the air. It makes indoor air healthier for people living with asthma. There’s less risk of an attack and the condition becomes easier to manage. It reduces odors either from the litter or the pet itself. It removes any airborne dust, pollen and allergens the pets track in from outside. These are the best air purifiers for pets. The HEPA filters can remove almost 100% of pet dander and other allergens in the air. These are not ideal for pets since some small particles of pet dander can pass through the filter. But they are great for eliminating pet-related odors. These purifiers do not use any filters. Instead, they produce negative ions that attach onto allergens and pollutants in the air, causing them to clump and fall to the ground. They are not very effective at eliminating all allergens and are ineffective against pet odors. Like ionizers, these do not use any filters as well. Instead, UV light is used to sanitize the air. These air purifiers are ineffective against pet dander and odor since they only target bacteria, viruses, and mold spores. Note: Most air purifiers for pets use a combination of the above air purification technologies. A typical HEPA air purifier will have a mesh pre-filter, an activated carbon filter, a HEPA filter, and an ionizer. Some also have a UV lamp. Do not buy an air purifier without a HEPA filter. It will be of no help at all. A HEPA filter is the only one good enough to capture the tiny particles of pet dander floating in the air, some of which are smaller than 2.5 microns. This is another must-have filter in a pet air purifier. While a HEPA filter excels at getting the tiny particles, an activated carbon filter does a great job eliminating unpleasant odors from your pet or the litter box. An air ionizer helps freshen up the air and reduce the amount of allergens in the air. But it is not essential. If you are concerned about exposure to ozone, you don’t have to get an air purifier with an ionizer. Before you buy an air purifier, check which size of the room it is rated for. Do not use an air purifier in a room that larger than the recommended maximum. 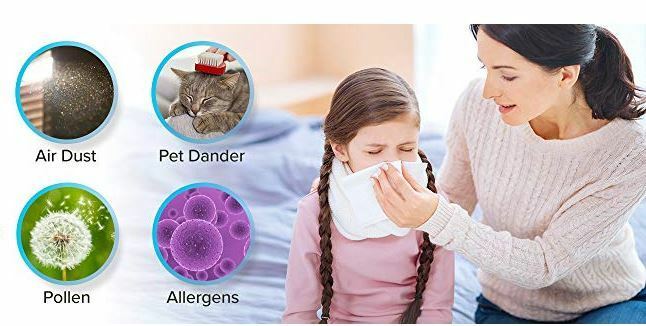 It will not remove pet dander and other allergens efficiently. Size: Make sure the air purifier doesn’t take up too much room. Size is also important for portability. A large air purifier is going to be heavier and more difficult to move between rooms. Auto mode: It’s not essential but it’s convenient. Auto mode allows the air purifier to monitor air quality and set the right fan speed automatically. Noise level: Check what customers say about the noise level at different fan speeds. Most air purifiers are going to be noisy at the highest setting so don’t let that put you off. What’s most important is that it be fairly quiet at the lowest and mid settings, which are the ones you are going to use most of the time. Dimmable lights: If you are planning to use the air purifier in the bedroom, check that there is a button to dim or turn off the indicator lights. Some air purifiers have a light sensor to sense when it’s dark and automatically turn off lights. Filter life: If you want a low maintenance air purifier, look for one with a filter life of at least one year. Filter life indicator: Tells you when it’s almost time to change the filter. Are air purifiers safe for pets? They might be spooked for a while by the noisy fan when it’s on high but the air purifier is generally safe for pets. The only concern is using an air purifier with an ionizer. The ionizer produces some ozone, though it’s usually below the safety threshold. But some pet owners are concerned about the long-term effects of any kind of exposure for themselves and their pets. If you are worried, look for an air purifier without an ionizer or one with a dedicated on/off control for the ionizer. Do air purifiers help with pet odors? Yes as long as you get the right air purifier. Make sure it has an activated carbon filter.It is highly effective at eliminating household odors including those from pets. Yes, as long as it is a HEPA air purifier. An air purifier will reduce the amount of pet hair in the room but only by a little. Compared to pet dander, pet hair is heavy and doesn’t easily float in the air. The best way to remove it from the floor and upholstery is using a vacuum cleaner. The best deals are online. Air purifier brands run frequent offers and discounts and you get to choose from a wide variety of options and prices. 16.5 x 9.9 x 21.9"
8.1 x 16 x 25.1"
15 x 7 x 24"
16.6 x 9.8 x 22.2"
24.2 x 22.8 x 9.8 "
10 x 17.8 x 26.8"